Have you seen the Toil & Trouble Collection from Creative Memories yet? 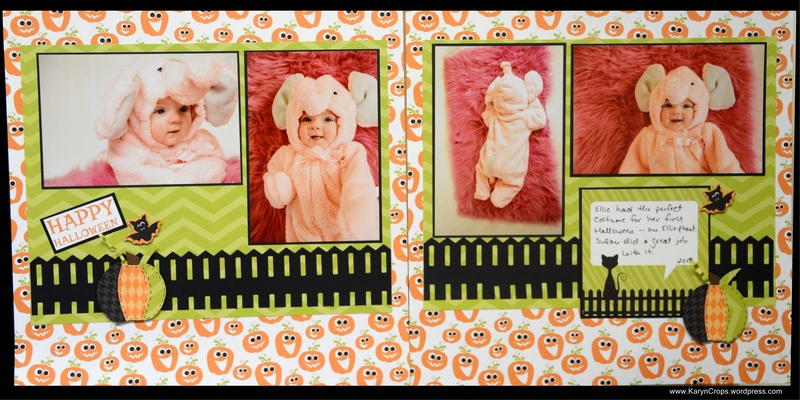 It’s super fun for Halloween pages, but the paper is doubled sided and has neutral prints that can be used for almost any occasion. I love the combination of the of bright orange, yellow, black and teal colors! On Friday, my friends and I at Creative Life Scrapbooking held a Virtual Crop on our Facebook Page. We shared six different ideas using the Toil & Trouble Paper and Stickers and the newest tools from Creative Memories. Make sure to visit our page and “Like” and “Follow” us. We have weekly features and special events where we share lots of ideas for using scrapbooking materials and tools from Creative Memories. Here’s the page that I shared on Friday. You can find printable instructions and a printable cutting template for the spooky tree on our Facebook Page. I used the NEW Victorian Fence Border Punch, the Original Border Maker System with the NEW Pumpkins Border Maker Cartridge, and the Custom Cutting System from Creative Memories to make my page. You can purchase all of these tools and the Toil & Trouble Paper and Stickers on my Creative Memories website. Copy and/or adapt my page and share a photo of it on our Creative Life Scrapbooking Facebook Page! We would love to see your version! Hello and welcome to our Halloween Blog Hop! Today I’m sharing a fun Halloween sampler that I made with the new Bats in the Belfry Paper Pack, Stickers and Embellishments from Creative Memories. This is a great project for those of you who love to decorate for Halloween and for those who don’t have Halloween photos to scrapbook. This is also a fun and easy project to make with children. Just cut out the squares and let the kids decorate with embellishments and stickers. The sampler looks great displayed on an easel, in a 12″ x 12″ photo frame or on your old Creative Memories Everyday Display. You can even add Halloween photos in one or two of the squares if you desire! I used our Garden Vine Punch (which is currently on back-order) and our Original Border Maker with our new Midnight Star and Picket Fence Cartridges. But you could adapt and use any other punches or cartridges. Click here to shop for any of these tools and/or materials. 1. Cut beige cardstock into five 3-3/4″ x 3-3/4″ squares. 2. Cut four pieces of patterned paper into 3-5/8″ x 3-5/8″ squares and adhere to the beige squares. 3. Using the border maker system with the midnight star cartridge, punch a border across the black cardstock. Cut a 3-3/4″ x 3-3/4″ square from black cardstock keeping the star border as the top of your square. Adhere this piece to your last beige square. 3-5/8″ x 11-3/8″ and adhere to beige piece. 5. For added dimension, you can run the large round end of a black pen across the edges of your pieces. 6. Using the custom cutting system and the 1-1/2″ circle pattern, cut a circle from the patterned paper using the red blade on the outside edge. Using the same circle pattern, use the green blade on the outside edge to cut a circle from the black cardstock. Adhere the patterned circle on top of the black circle. 7. Adhere all pieces to a sheet of 12″ x 12″ grey cardstock. 8. Using the border maker system and picket fence cartridge, punch fences from the black cardstock and the wood patterned paper. Add using foam squares. 9. Add embellishments and stickers using foam squares on some as shown. Add rhinestone embellishments. Please continue to the next stops on our Halloween Blog Hop! I’m loving our new super cute Trick or Treat Paper and Stickers! The little prints on these papers are darling. 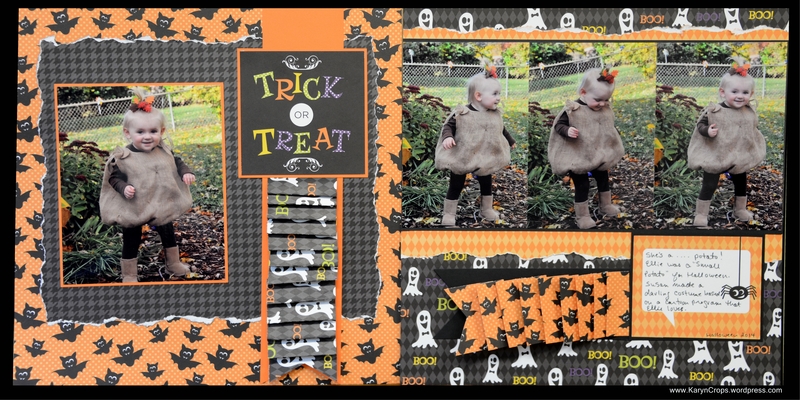 For more ideas using the Trick or Treat Paper Pack and Stickers, click on Blog at the top of my CM website and follow the Blog Hop to see more ideas from other CM Advisors. I made the fence by punching a sheet of black cardstock with our Border Maker and Picket Fence Cartridge. Cut the border to 2.5″ wide, flip over and punch the second edge with the Picket Fence Cartridge also. Then trim off the pointed ends of one side of the border to make the fence as shown. Make the pumpkins by punching 3 circles of different patterned paper. Overlay the 3 circles, and using your scissors cut notches from the top and bottom and semi-circle shapes as shown. Select one shape from each paper and reassemble into a pumpkin shape and add pen stitching. The title, bats and journaling box are cut from some of the sheets of paper in the pack. To make the ribbons on these pages, cut paper strips to 2 inches wide by 12 inches long. Working from one edge of a strip, make over-lapping folds to create the paper ribbon. The title and journaling box are cut from some of the sheets of paper in the pack.